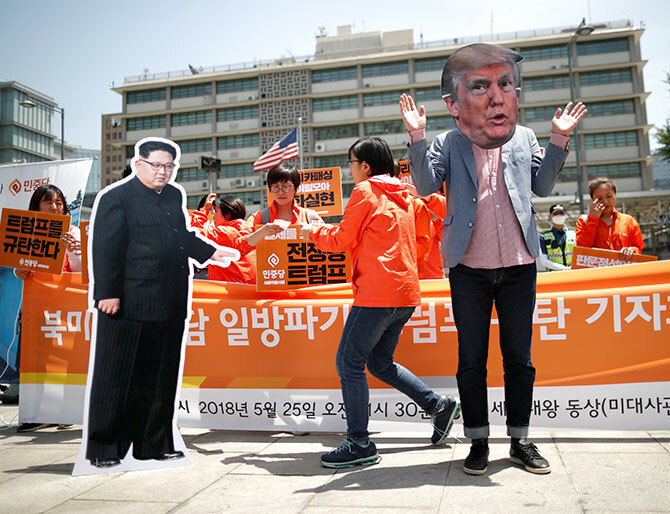 Rediff.com » News » Why did Trump cancel the summit with Kim? Why did Trump cancel the summit with Kim? 'Trump forgets that Kim is not one who likes to be treated publicly as a pauper; he wants to come to the table as an equal, and from a position of perceived strength, not as a suppliant,' says Dr Rajaram Panda. Five months into 2018, the much hyped dawn of peace in the Korean peninsula that started with North Korean leader Kim Jong Un's expression of his desire for peace resulted in a summit meeting between Kim and South Korean President Moon Jae-in on April 27 at the peace village in the demilitarised zone of Panmunjom. This significant event was preceded by the participation of the North Korean delegates in the Pyeongchang Winter Olympics hosted by South Korea in early February. The bigger news that emerged because of sustained negotiation and the pursuance of Moon and Kim was the agreement for a summit meeting between US President Donald J Trump and Kim. After several venues and dates speculated initially for the summit to take place in late May, it was finally announced that Singapore would host the first-ever summit between a sitting American president and a North Korean leader on June 12. In the latest turn of events, Trump announced on Thursday, May 24, that he was cancelling the planned summit with Kim, citing the 'tremendous anger and open hostility' in a recent statement issued by North Korea. Earlier, what transpired from all the flurry of diplomatic activity was that a way could possibly be found to resolve North Korea's nuclear problem. This much hyped optimism soon came under threat with Kim crafting a careful message in which he said that North Korea would never use nuclear weapons or transfer nuclear weapons or nuclear technology 'unless there are nuclear threats and nuclear provocations' against it. North Korea's nuclear weapons, Kim further said, are 'a powerful treasured sword for defending peace' that guarantee future generations 'can enjoy the most dignified and happiest life in the world'. This statement sounded as against denuclearisation. If in such a conditional situation, Kim travelled to Singapore for the summit with Trump, it would be open to interpretation as to who has the upper hand. If Trump accepted such demands and conditions put forth by Kim, Kim's position only would have risen in the world. This conditional demand by Pyongyang and Washington's stance to seek complete and irreversible denuclearisation could be the reason that derailed the peace process. There remained several imponderables that remained dormant, but could not be kept under the carpet for long. The first fissure was both Trump and Kim wanted to claim credit for agreeing to hold the summit. Trump claimed Kim had succumbed to his sustained pressure. It was tough for Pyongyang to concede that he could force Kim to come to the negotiating table. It was difficult for the North Korean people to accept that their leader could be fallible. Unlike the US media that went bombastic about the summit possibility, the North Korean media was circumspect, reluctant to divulge government positions. The US and the world kept its hopes high after Pyongyang released three American prisoners following US Secretary of State Mike Pompeo's visit, during which the summit date of June 12 was finalised. The US seemed to spoil the atmosphere of détente when it erred with National Security Advisor John Bolton suggesting Pyongyang must unilaterally give up its nuclear weapons before easing of trade sanctions could begin. Such a US stance was opposed to Pyongyang's often-stated policy that its precondition for denuclearisation is an end to Washington's 'hostile policy and nuclear threats'. The other dimension of the North Korean imbroglio is Kim's recent cosiness with Chinese President Xi Jinping as demonstrated by his two visits to Beijing in quick succession for possible briefings before committing anything to either Moon or Trump. What really transpired between Xi and Kim remains shrouded in mystery, but the world is aware that China is North Korea's strategic ally and that China has its own strategic consideration in devising its North Korean strategy. Whatsoever Trump and other US allies think about North Korea, it is unlikely that Beijing's existing stance on North Korea will change. Against this ground reality, Pyongyang's way of seeing Washington as the root of all its problems is unlikely to go away so soon. The outside world has an erroneous understanding of North Korea. When Kim announced his decision before the 100-plus members of his party's central committee to suspend nuclear tests and ICBM launches, Washington interpreted it as a major pre-summit concession. What Kim meant was that since his country has become successful in developing nuclear weapons in just five years, there was no more need for testing and that now was the time to focus on economic growth. It is possible Kim discussed this with Xi when he visited Beijing. North Korea also declared that it would dismantle its nuclear testing site at Punggye-ri. Punggye-ri has been the site for its six nuclear tests. Keeping to its word, North Korea carried out the demolition on May 24 in a public event attended by 30 international journalists. North Korea first announced it would dismantle the site following a meeting of the country's ruling party in late April. The plan was later confirmed by Moon during his talks with Kim on April 27. The annual military drills between the US and South Korea was another stumbling block in the peace process. Pyongyang has always opposed the drills, which it sees as 'rehearsals for invasion'. Therefore, when the US and South Korea announced it would go ahead with the exercises, Max Thunder and Foal Eagle, part of annual exercises that date back 40 years, Kim lost no time to renew threats to step away from denuclearisation. The US and South Korea are consistent in their explanation that the annual exercises are strictly defensive and non-provocative. Pyongyang did not buy this argument and rejected the Pentagon spokesperson's explanation that the defensive exercises are part of the alliance's 'routine, annual training to maintain a foundation of military readiness'. Kim Kye Gwan, North Korea's first vice minister of foreign affairs, threatened that the Trump-Kim summit could be cancelled 'if the US is trying to drive us into a corner to force our unilateral nuclear abandonment'. What provoked Kim the most was Bolton's comments that North Korea could face a similar fate as that of Libya's Muammar Gaddafi if no agreement was reached during the Trump-Kim summit. Bolton has repeatedly suggested the Libya model of unilateral disarmament for North Korea. North Korea angrily denounced his comments and threatened to scrap the summit. As a damage-controlling measure, Trump quickly distanced himself from Bolton's comments and sought to placate Kim by saying his security would be guaranteed in any deal and his country would not suffer Gaddafi's fate. Trump put the blame on Beijing, saying Kim was possibly influenced after his two visits to China. The US leader reassured Kim that he was not pursuing the 'Libya model' in getting North Korea to abandon its nuclear weapons. Gaddafi, it may be recalled, was deposed and killed after Libyans joined the 2011 Arab Spring protests, aided by NATO allies who encouraged him to give up his banned weapons of mass destruction under a 2003 deal. Pyongyang termed Bolton's suggestion of a deal similar to that under which components of Libya's nuclear programme were shipped to the US as 'absurd'. The sticking point was how both sides interpret the term 'denuclearisation'. While the US and Japan demands 'complete, verifiable, and irreversible' dismantlement of North Korea's nuclear weapon programme, for Kim it means the entire Korean peninsula, including South Korea. This would mean the withdrawal of US forces from South Korea, implying abrogation of the security alliance between the US and South Korea. This would be difficult. Pyongyang has rejected unilateral disarmament and gave no indication that it is willing to go beyond statements of broad support for the concept of universal denuclearisation. Trump's offer of a carrot cannot buy Kim's compliance to his demand for complete denuclearisation. Neither can Trump's assurance that China, South Korea and Japan would invest a lot of money in North Korea if the latter agreed to give up its nuclear weapons. Trump forgets that Kim is not one who likes to be treated publicly as a pauper; he wants to come to the table as an equal, and from a position of perceived strength, not as a suppliant. Kim's expression of willingness to pursue denuclearisation of the Korean peninsula is a promise he made in the past which meant that Pyongyang would pledge to eliminate nuclear weapons just as the US did under Article VI of the 1968 Non-Proliferation Treaty. This essentially means never denuclearising. Though India was never involved directly in the inter-Korean nuclear talks, despite the fact that it maintains cordial relationships with both countries, India sent its second rank Minister of External Affairs General V K Singh (retd) to Pyongyang for discussion with senior government officials. India is concerned about North Korea's past nuclear links with Pakistan and needed assurance that Pyongyang would keep India's concerns in mind while dealing with Pakistan. South Korean President Moon is scheduled to visit India in July. This would be a good opportunity for him to discuss with his Indian counterparts inter-Korean issues besides bilateral matters. Though India's role would remain limited in resolving the inter-Korean issues, India's involvement would be a welcome development. It would be a good opportunity for India to showcase its persuasive diplomatic skill for the resolution of the Korean problem if it chooses to do so. Dr Rajaram Panda, former Senior Fellow, IDSA, was until recently ICCR Chair Professor at Reitaku University, Japan.